Sun., July 15, 2018, 7 a.m.
One might picture solar-energy pioneers as aging hippies clad in beads and tie-dye. But his sister and business partner, Eco Depot President Nadine Sullivan, could be mistaken for a museum docent. Since 1999, Eco Depot has installed more than 1 million watts of solar power – the equivalent of more than 3,000 rooftop photovoltaic panels. The company also sells building materials, including recycled paint. During a recent interview, Sullivan discussed batteries, Budapest and buffalo nickels. Sullivan: In Spokane. I attended Lewis and Clark High School. Sullivan: I was really interested in archaeology – the digs sounded fascinating – but I became an elementary school teacher instead. Sullivan: I was a car hop at the Top Hat drive-in on East Sprague. I worked three summers while attending Eastern (Washington University). S-R: What did you do after graduating? Sullivan: I taught second grade in the Central Valley School District for one year, then taught two years in Vancouver, Washington, and subbed for another five. After baby number three, I quit altogether. S-R: Did you have any other careers before launching your own business? Sullivan: In the early ’90s, I worked as office manager for a company that sold waste-oil heaters. My brother came on as a salesman. When one of the owners died, the other decided to close the business. Bruce already had $40,000 in proposals written, so I went to SCORE (a nonprofit organization that provides free mentoring) with a business plan. It took three tries, but we eventually opened with a $25,000 SBA startup loan, a phone, a fax and two file boxes in the trunk of my car. 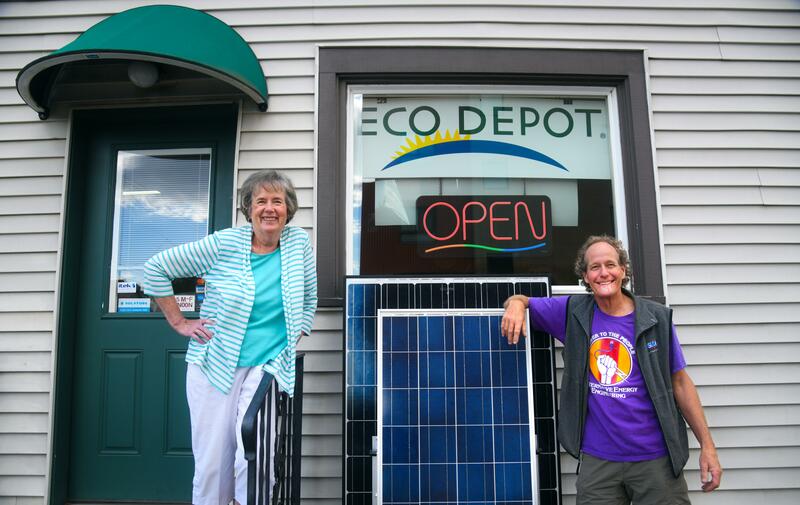 After we did our first solar-energy system in 1999, Bruce suggested we change our name to Eco Depot. S-R: Did any skills learned in earlier careers transfer to this job? Sullivan: I learned about money management from the owners of the waste-management business during the five years I worked there. For instance, don’t use the business as your personal cookie jar and don’t spend more than you take in. S-R: When you transitioned to solar packages in 1999, how mainstream were photovoltaics? Sullivan: Not very. But Jim Sheehan, who owns the Saranac and the Community Building downtown, asked us to install solar. The Community Building was our first commercial project. S-R: Have government incentives played a role in stimulating interest in solar energy? Sullivan: Yes. Besides a 30 percent federal tax credit on PV systems, Washington is a net-metering state (meaning utilities must reimburse residential producers of excess solar-generated electricity). For a while, Avista paid customers 54 cents per kilowatt hour, up to $5,000 a year. And until last October, we didn’t have to charge sales tax on solar equipment. S-R: How has the business evolved? Sullivan: Sales have been up and down. I wasn’t sure we were going to make it in 2008. There were months I didn’t pay myself, but that’s part of being a business owner. S-R: What did you learn during the lean years? Sullivan: That it’s important to have a line of credit and a bank that trusts you. S-R: What has the cost of PV systems done since 1999? Sullivan: They’ve come down dramatically. Back then, one watt of generating capacity cost about $8 or $9. Now it’s $3 to $3.25, installed. And the incentives reduce that even more. When we started, it took 20 years to recoup your investment. For a while it dropped to around five years. Now we’re at about eight. S-R: What else has changed? Sullivan: Twenty years ago, solar power was a philosophy. Gradually, it’s become more practical. You don’t have to be nerdy anymore to appreciate it. You can monitor your power output online, which some people find entertaining. S-R: How would you characterize your clientele? Sullivan: For years, our target market was baby boomers because they were the ones with money. Now we’re getting a lot of younger homeowners. Sullivan: From the Canadian border to Oregon, and from the east slopes of the Cascades into Montana. S-R: Are most of your customers also served by utilities? Sullivan: Yes. We refer off-grid customers to installers who specialize in those systems. That’s a different ballgame. S-R: What’s the price range of typical solar packages you sell? Sullivan: Anywhere from $6,000 to $45,000 because there are so many variables. S-R: What does that price include? Sullivan: The PV panels. Microinverters – one for every two panels, instead of the old central inverter. The ECU (an on-line monitoring system). And turn-key installation, which includes all the hardware, labor and permitting. S-R: Where are the panels manufactured? Sullivan: Most of ours are made in Bellingham. We avoid using Chinese-made panels since there are a half-dozen manufactures in North America. S-R: Do banks loan on solar packages? Sullivan: Some do, including Puget Sound Credit Union and Umpqua Bank. S-R: Is this a reasonable do-it-yourself project? Sullivan: We have people who self-install. We joke that every self-install equals about 20 phone calls. S-R: As president of Eco Depot, what is your role? Sullivan: I manage the day-to-day stuff – ordering, sales, paperwork. Bruce designs the systems, pulls permits, installs, and maintains inventory. Sullivan: As long as we can get on a roof, we stay busy. Snow can slow us down for a couple of months. S-R: What are the pros and cons of solar energy? Sullivan: The best thing is it reduces your monthly consumption of utility-source electricity, which saves you money. A downside is that some people think the panels are ugly. Homeowner associations may require approval before a roof array can be installed. S-R: Do you have solar panels on your own roof? Sullivan: I do not. I have too many shade issues. We have them on our store (at 1326 E. Sprague Ave.), and Bruce has them on two of his houses. S-R: When someone learns what you do, what do they ask? S-R: What do you tell them? Sullivan: First, I ask if they have a south-facing roof and any shading. Then we break it down to how large their roof is – the number of panels it can accommodate – and how much they want to spend. We’ve installed systems as small as two panels. But one customer started with 30 panels, then had us add another 20. S-R: Do some people hope to meet all their electrical demand with photovoltaics? Sullivan: Only if they’re going off-grid, and that would require a whole list of decisions about insulation, batteries, propane appliances, wood heat and other considerations. For urban customers, these systems supplement their utility power. If they add battery backup, they also have electricity during power outages. S-R: Have batteries gotten cheaper? Sullivan: Actually, battery prices have gone up. They can run $600 or $700 apiece. Depending on your load, you might need four to six, and they only last seven to 10 years. Everyone is eagerly awaiting the next generation of lithium-ion batteries. S-R: What feedback did you get after the 2015 windstorm? Sullivan: None of our customers lost solar panels. S-R: Your East Sprague neighborhood saw major street and sidewalk improvements recently. Has that been good for business? Sullivan: We’re a destination store, so we don’t rely much on foot traffic. S-R: As a business owner, what are you most proud of? Sullivan: That we have survived for 24 years. S-R: Have people approached you about buying Eco Depot? S-R: Does that possibility appeal to you? Sullivan: Since I just turned 75, it does. I’m about ready to do something else. S-R: What’s on your bucket list? Sullivan: I like to travel. I’ve been to China, Australia, Thailand, the U.K., Prague and Budapest. I’d like to go to Russia next. S-R: And lastly, what’s your secret talent? Published: July 15, 2018, 7 a.m.